Andy Warhol was the artist of the sixties just as the Austin Mini Cooper was the car of the decade. Kirk & Hamilton bring these two style icons together in this wonderfully colourful design. 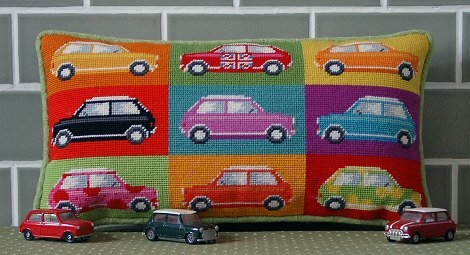 The kit uses Anchor tapestry wool on 12hpi canvas and measures 15½" x 8½" (39 x 21cm) suitable for a pillow or cushion. Contents: Printed canvas, chart, wool, needle and full instructions.